A group of dinosaurs is happily playing in the school yard when . . . oh no! Here comes the Mine-o-saur! He snatches all the toys. He grabs all the snacks at snack time. He hoards the blocks during recess. And all the while he yells, ?MINE, MINE, MINE!? But soon enough, no one wants to play with him. What will it take for the Mine-o-saur to realize that what he really wants are friends? And then, will the other dinosaurs ever welcome him back? 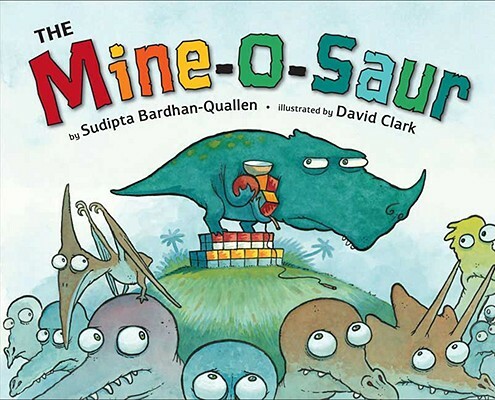 Dinosaurs are always a popular subject with young readers, and with its subtle lesson of sharing, The Mine-O-Saur is also a delicious twist on a classroom comedy. David Clark?s uproarious triceratops and stegosauruses will tickle the funny bone of readers young and old.